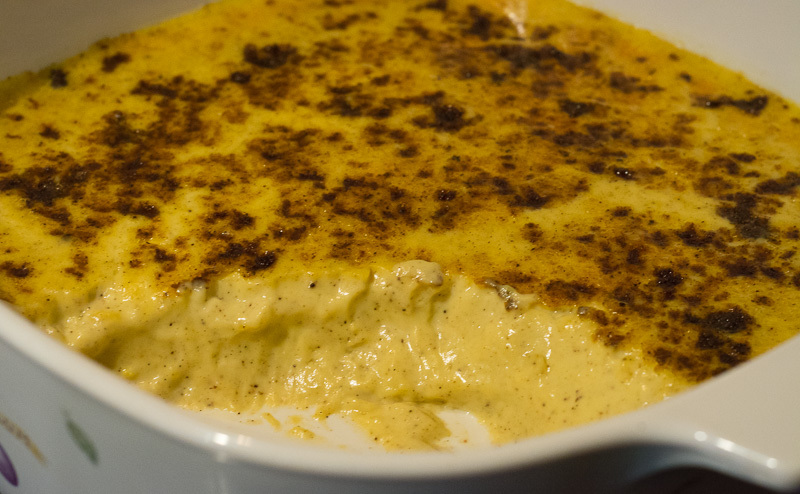 I thought I'd post the baked custard that I have been making lately, I like this better then custard over the stove because I find this lighter and not eggy. When you add water to the water bath make sure that its just hot water rather then boiling water, I jut use my hot water tap. You need a 1 litre dish which for those overseas I think is around 2 pints? mines a little bigger then that as you can see in the photo but my custard is turning out really well so I won't change it. How deep or shallow your dish is may effect your cooking time. With your sweetener, being a custard, texture is important so you want to make sure it dissolves so if you are using a really grainy texture sweetener you may want to try processing it to make it fine or warming up the cream with it to help dissolve it then let it cool down before mixing into the eggs. I'm using pure vanilla powder and I notice it so I might see if the powder dissolves in warmed cream. Anyway this is really nice in the cool weather and would be yummy with some stewed berries. I like it warm and at room temperature best. This is really quick to put together and only needs a few ingredients. Make sure you mix eggs with fork so you don't incorporate air. My oven is fan forced electric. Mix eggs. sweetener and vanilla with a fork until sweetener is dissolved. Stir in cream then pour into small oven proof dish (1 Litre). Give a good tap and smooth out as many air bubbles as you can. Sprinkle nutmeg over the top then place dish into a roasting pan. Using a jug gently pour hot water into the roasting pan about halfway up the dish then place into the oven on the middle rack. Take straight out of roasting dish and allow it too cool for a bit, it will firm more as it cools. Coconut Cream: You can replace cream with coconut cream to make it dairy free and paleo friendly. I have tested it and it works but may need slightly less cooking time. I also think coconut cream would be best with different flavours such as adding cardamon and omitting the nutmeg. Extra Egg: As suggested by @ChrisA (read replies below) you can add an extra egg for a thicker and richer custard, I have tested it and it works fine. This is the nutritional information for the entire recipe minus the sweetener and using the information for organic vanilla extract rather then the powder which I cant find information for. When working this out add the information for whichever sweetener you use to this total and then divide by how many serves you have. I have used information for extra large eggs and estimated 1/2 tsp of nutmeg. With the cream I used the average all brands on calorie king which was 3g carbs per 100 ml, mine was actually 2.9g but all the brands listed on calorie king were higher so please check labels. The post was edited 2 times, last by Sherrie: add variations ( Aug 26th 2015, 11:12am ). A word of advice when buying vanilla extract, check your labels for example when it comes to the brand Queen. The organic label is 0.3g carbs per teaspoon whilst the other two are over 4g which I was not expecting! 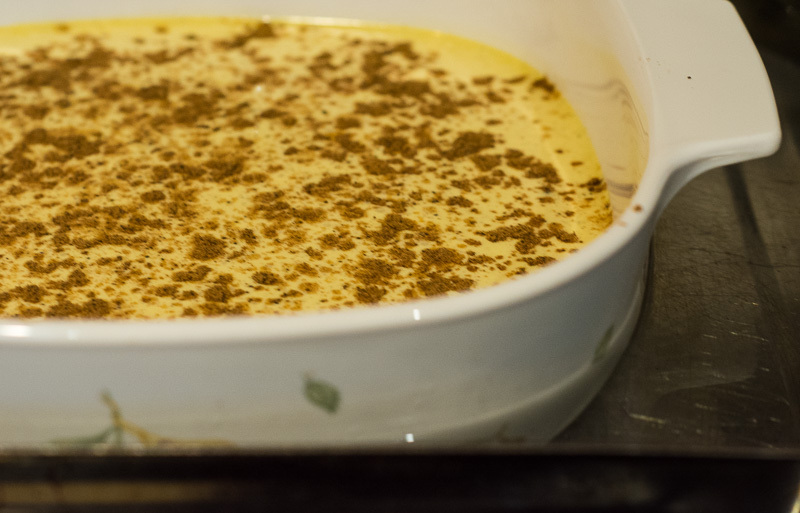 Your baked custard recipe was DELICIOUS ! I used 4x eggs but otherwise the same. Even DH said it was awesome. Was it eggy with 4 eggs? I used to love the Jamie Oliver custard but I found it was very eggy and rich. I made a coconut cream version today will need more tweaking on the cooking time but I think I'm going to make another variation with cream instead. Sherrie not eggy at all and I wanted it thick - I use good eggs the same as you - it had a serious wobble when I got it out but its perfect , my oven is a pile of crap ! but I cooked it at 160 for about 50 mins. Did you cover it whilst still hot? Ok - how is your 4x egg custard ? No I didn't cover mine whilst hot............ but hey when it was cold , I had a few spoons and it was like crème Brulee kind of hard on the top and had set even more - it was awesome !!!! Yes it was good, Garry thinks it was a bit richer which he likes, I will make a 3 egg one next and compare as the last one was the coconut one which is totally different. Going to have to do this!!! Sounds really nice.. It will be interesting to see the effect on your blood sugars! I will be making more this weekend , oh what to have with it ?? ANY SUGGESTIONS ? I had some again yesterday and i realised it definitely lost the lightness that I was after, it still wasn't eggy which is good. Garry likes the richness. I made this again yesterday but I only used 1.5 metric tablespoons of sweetener which is just under half of the original amount and it was great. I prefer to have things just sweet enough plus that way if I ever pair it with fruit it doesn't become too sweet. Saw this on Chris's thread. Have to give it a try.